We may be tired, we may be off form, we may be getting used to new formations, but you will NOT beat us. My 600th game!! So happy right now. he makes me write crappy haikus, but I don’t give a doggy’s doo-doo. take a bow, son, you’re beyond belief. Picture of Cesc getting stuck in…. What a warrior. oh, yes! thanks for posting that HL link! FC Barcelona. I. Love. You. Ended up adding more pictures. Euler… where art thou!!! Waiting to get hectored by Euler. messi seems to be wracking up quite the long list of celebrations… he must have a cheat sheet somewhere. Best commentary ever.never understood anything, but still. I thought it was Portuguese, as it said our favourite term “Por Que” at some point. But I loved the energy of the commentators. So much Epic in that first picture!! Thanks Kari! Great win today. I was on edge for a week prior to the game, but this morning I felt calm and sure that we would get a good result. That’s the beauty of this team, they instill such confidence even when things look bleak. Visca!! Seems like Alves has been working on his crosses. They were gorgeous today. That Alves cross reminded me of the one he made for Ibra classico goal. Typically same, long cross to player on the far post to shot / head in. Before the match I thought that one of the keys to the game was whether Alves would bring his “A” crosses/passes and Busquets was just awesome. I don’t understand the flak that Cesc has been receiving. He was everywhere offering himself for passes. Proud of the team, really showed that if Madrid came out to play football and not kick our shins, we would win and it’d be a great match. It was exciting. MOTM: Guardiola !! ps: Don’t mind what Mourinho says and all his petty excuses, if you read the enemy’s blog and comments, the fans are disappointed with his tactics and the fact that even though CR7 doesn’t show up in big games he still plays. Some DO see the light. Visca Barça !! Best team in History !!! now onto our next title. Oh and the goal by Benzema was luck too because of VV’s mistake. It was all on him because he had tons of time and wasn’t under any sort of pressure at all. So the Special One, that was luck too. The goal by Xavi was luck but it was due to the pressure from us. It’sa different thing. Player making mistakes because of pressure and players just making a mistake. Two totally different things. Exactly. There were two elements of of luck in RM’s goal: Valdes gifting the ball to di Maria, and Ozil’s shot deflecting perfectly for Benzema. With Xavi’s goal, he showed excellent technique to hit that ball with pace and power, forcing a panicked touch from Marcelo that allowed it to sneak in. Both were lucky goals, but under very different circumstances. Also, did anyone see Puyol rallying his teammates immediately after RM scored? The perfect captain! Nothing lucky about Alexis and Cesc’s efforts. I know we love Iniesta and he was amazing in the second half but he wasnt THE MOTM. He turned it on when he moved back to midfield with Xavi and there was more space afforded to us but we were already leading. Definately one of my fave players but I dont think one half of genius should be enough for him to overshadow the FULL GAME MOTM work of Puyol and Busquets. Yea i also picked the sergio,puyol duo as my men of the match.All the other players had their moments, but these two were perfect from the beginning to end. Even during the opening 20 second period Busquets was still completely awake to the danger and on another day the ball drops somewhere else after his two blocks and there is no goal. Not dissing those two at all – I was one of those advocating Puyol for this match and he was absolutely brilliant – but Iniesta’s first half was not entirely of his making. Pep is receiving (deservedly) a lot of accolades today but he was the one who asked Iniesta to play on the wing first half despite it being quite clear that it has never really worked. Pep was also the one experimenting with 3-4-3 in the run up to this game rather than give our back four a chance to have game time together – I’m sure that was the cause of some of Pique’s rustiness although I thought he played well overall. I’m not saying he is wrong to try something new but I would have liked less tinkering in the approach to this game. Can’t wait to watch revista and press pass!!! Guillem and Tommy. All Credit to Pakman and his wonderful blog where you can also download the full game if you want. file was deleted. what did they say? OT: But who do we play on Thursday in WCC? I’m a bit surprised EE went with 4-2-3-1 and didn’t play their trivote without real target man up front (4-3-3). I think their decision came from superior mood and nothing to lose on points (have 6 points lead) building up to this classico. They went out with attacking formation. The consequences, the intensity of their pressing in the midfield was a bit lacking. In addition, brilliant strategy from Pep using hybrid 4-3-3 at the beginning the switch flawlessly to 3-4-3 and some moment we saw 5 players in the middle with Cesc dropping deep resulting supremacy in the midfield. Not the best performance alike the manita, but our team showed up when it most needed. All admiration for Pep. Very courageous tactically. By the way, Tito looked so pale last night. Appreciate his exertion to made the trip to Madrid. But hopefully he’s not going to Japan. I know how much you love this team Tito, but your health is utmost priority right now. No – he didn’t fly out to Japan with the team. Tito travelled to Madrid separately with his wife. This is because the team was flying directly to Japan from Madrid after the match – hence no after-match comments from Barca. They had to leave then in order to reach Narita before the airport closes for the night due to night-time flying restrictions. Glad Tito stay home. Thanks bud! I don’t really blame Valdes for that goal. If you play football then you know how extremely distracting and annoying it is when you’re deciding where to pass and suddenly your teammate tells you to pass somewhere else. This is the situation I saw today with Valdes, I think initially he had wanted to pass it a certain direction but with Pique shouting at him where to pass, he lost focus and made an error. They’re CL-level professionals, not us. Maybe as you say some blame should then ALSO go to Pique but that was very very much Valdes’ fault. Saw the game with the FC Barcelona club members in melbourne! The reaction to Alexis’s goal was epic! To Cesc’s goal was orgasmic! Pure football..Gràcies Barça…Barça estic boig per tu! Pep Guardiola.. please stay for a decade more and do what Alex Ferguson did to Liverpool’s legacy for United. Please! Yeah, I believe Pep has unconditional possibility to be Barca SAF. great to actually get to watch a match. I must admit, i’m not committed enough to wake up at 4:30am on a regular basis when the sun comes up at 8:45. Great game (for a fan at least) and the team played well. First goal: Valdes errored but what was Pique doing? Kept Benzema on AND didn’t mark him. Where did Ronaldo go? He really shouldn’t play verse Barca. Ozil, Kaka, and Benzema were more dangerous. Puyol had his number all night and he couldn’t do anything to Abidal either. Some silly author over at BS.com was talking (again) about how Ronaldo is the better player and that if you traded Messi and Ronaldo to the opposite teams, Barca would be so much better. said something like if you had one draft, ronaldo should clearly be the first player. ha! I liked our formation. To me it basically looked like a 3-2-4-1. Back three; Busquets and Xavi(sometimes Cesc);Iniesta-Messi-Cesc(sometimes Xavi)-Alves; and then Sanchez often playing alone up top. Puyol is amazing, but I was still a bit surprised that we didn’t see Mascherano. We wondered that about Pique too, but when you watch a replay, you can see that he’s trying to cover the goal (alongside Valdes) against Oezil’s strike. He was damned both ways – if he had come out to put Benzema offside, there was a possibility of Oezil scoring in that direction. I’m a bit confused. Having just watched most of the game again it seemed to me that we started off with a straight back four ( thank goodness !) and then Pep moved Alves up to right midfield/wing, Puyol across to RB and Busi back into the back four. Was that not what happened? I didn’t really see a three at the back. No, Busi only dropped back for short periods so you can’t really count him as part of the backline. Anyway, Pique has confirmed that they switched to 3 at the back after the first while. I’m with you Jim, saw the same, Alves up, Busi back but marking higher up, and pushing forward in attack, I thought they looked 4-4-2 ish but Alexis was too alone up top, I believe some analyses today have called it 4-4-1-1. Need another watch, but sure Eulers review will be up with details of the amoeba morphing before that. It was 3-5-2 in both intention and shape. Busi may have been positionally at times looked back line, but he was playing holding mid and part of the effort to overload the midfield. Surely not our best game, and i particularly didnt like our pressing, soemtimes it was non-existent, but hey nothing is perfect and we get a win, yeaaaaaaaaaaaaaaaahhhhhhhh. You can convert to your local time by hitting the button just below the chart. Cesc eagerness to run from box to box was remarkable. That is a very nice video. Random stats: Guardiola has beaten EE and Bilbao (as a coach) more than any other Liga teams. Fabregas has more headed goals this season than he had his entire time in the Premiership. Random amazement: It still boggles my mind that people are questioning Casillas, who was immense yesterday. Were it not for him, it would have been 5 or 6 goals in. His early stop on Messi was money, then a later one in the first half, then the sequence in the second, where we were battering at the gates. Dude is money. Random thought: Having watched again, the good behavior in this match convinces me that folks talked before it, probably during last International break. Pepe and Marcelo were business as usual, but even they were less aggro. Kxevin, that video is possibly one of the most heart-warming thing I’ve seen in a long while. I did notice that Iker in particular went out of his way to congratulate the Barça players, and especially his Spain teammates, after the match. Puyol, Iniesta, Xavi, and even Sergio Ramos as well. Marcelo, OTOH, refused to shake Pique’s hand for no reason that I could see. Puyol’s reaction to Benzema’s goal is just perfect, exactly the stuff you expect from El Capitan! That’s why he’s the Captain, and is irreplacable. But it’s also worth noting that we are a club of (mostly) homeboys, and they are a club of expensive imports. Yes, they feel the fire, but can they feel the fire as much as someone who came out of the Masia, and understands everything that this match means? Look at the reactions of Fabregas, for example. At times when a player has to dig deep, I sometimes wonder if things such as that don’t make a difference. Look at the tackle/Malachi crunch that Messi avoided long enough to slide the ball to Sanchez, for example. A less-committed player maybe holds the ball a second longer, rather than accepting that there will be punishment, but the reward will be sweet. I daresay we might have not rallied without Puyol on the pitch to buttress, make stops and interceptions and just be a general badass. The presence of a player such as he is enormous. Casillas is their captain, but how can a captain get in the faces of players who don’t have roots in the system. What can Casillas say to Thong Boy, for example, or Marcelo? Khedira feels team pride because it’s the place that’s paying him to play football. Xavi feels team pride because it’s his family, his mother, his birthplace as a player. It’s so hard to place a value on that quality. In the same vein, we might note that when tensions explode in the Clásicos, Casillas doesn’t get in his players’ faces. He gets in the faces of his España teammates at Barça. Remember last year’s Clásico — Casillas was jawing at Piqué, and Piqué was saying “no, no, Iker, oh no” right back at him. I don’t think that Iker means to step on Puyol’s toes; I just think it’s instinctive for him to appeal to his blaugrana brothers rather than try to reach Marcelo or Pepe. Or even Ramos, really. He goes over to Gerry and Carlito to make excuses for Sergio. And then Gerry and Carlito respond by appealing to Iker to keep his Madrid players in line. Interesting dynamic. I went and silently lurked among Marca readers last night just for some schaudenfreude fun. And even though there is disappointment, and even some frustration for Iker (too much Carbonero, they say, but just as we razz Piqué for too much wakando la waka), they are really angry with Coentrao, Pepe, Marcelo … which is ethnically-based “code” for Mourinho. Some come out and clamor for the canteranos. Others say the team isn’t “really” Real Madrid. And others just come out and say the team is “too” Portuguese. It’s dancing the line on ethnic derision, which is still dicey for a Madrid team even in the EU age. But I think the sentiment is more closely related to Kxevin’s idea … that the fans remember the “old guard” who rose and fell with the Royal Whites, and they have that same passion and zeal for their home-team, and they sense the same in Barcelona’s fans *and* players, and it leaves them “desilusionados”. Let’s remember, too, that a soccer fan’s greatest pride is his national team, and the Spanish selección is a Barcelona on its face with Madrid freckles, and the most beloved Manchego is a blaugrana star. It stings, it hoyts. Instead of getting in his players’ faces, then, Iker settles for making an Iker face at them. Kxevin.. stop writing so good stuff.. it gives me the barca blues.. But pressing is an art. Some in Madrid’s squad are fit enough for it but not bright enough for it. It’s a high-wire act. Anyone can stand on the tightrope, balance with the pole and bend his feet around the taut metal rope. But can you make it to the other side without falling down once you’ve made it half way? Can you resist the urge to look down? In terms of pressing, these were the tests Madrid failed. 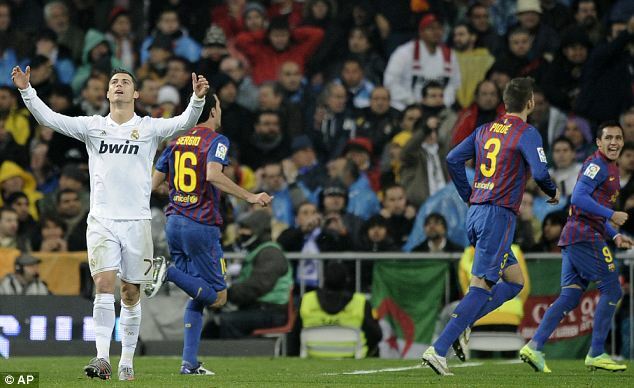 – Barça put an end to a Real Madrid 15 game winning streak, 10 in the league and 5 in the Champions League. It’s also Mourinho’s team’s first defeat at home (this season). – Xavi played his 600th game for Barça, and he celebrated by scoring a goal with the unwitting help of Marcelo. – Pique and Puyol have played 55 League games together, and the balance is 46 wins and 9 draws. – Puyol, on Saturday, won 14 balls without losing any. He committed a single foul and was also fouled once. – Another different lineup after 26 official games. Guardiola still hasn’t repeated the same starting eleven this season. The starting line-up for the Clasico was brand new. And I believe that the team only knew their positions, 90 minutes before the game. And it’s Xavi’s 13th Clasico; he debuted and scored his first goal against Mallorca on August 18, 1998. Wow, lucky 13 and eights for the maestro! The other important thing to note is that we did a great thing yesterday, but it will still be a 3-point lead for them if they win their match in hand. Their fate will be in their hands, and we will need to be perfect. We cannot afford to drop a single point for the rest of the season. Even then, even if we win the home Clasic, we would win the Liga on head-to-head. There is no margin here. None at all. Right, yesterday like Messi said, its a moral victory mostly we still made the mistakes in the past, we didn’t erase those. Too true. La Liga standings on the edge of a knife! Madrid’s next match is Sevilla, and that old mare ain’t what she used to be. Clásicos are always explained away as either “just one match in a single season” or, inversely, “a very special match in what is otherwise a regular season”. But I think that recent Christmas Clásicos have a deeper resonance, too: We wring our hands in anguish. Sure, we’re an historically-great team, but they’re so much better than last year! They’ve made tactical improvements! They’re goleando every one of their opponents! And we’re … doing great! Really! Even if we’re a point or so behind going in. It’s just a game in a long season, right? And then this team just explodes in a blaugrana confetti all over the pitch! What is more amazing — that Tito drags his tired self to the bench to be with his men in their hour; that don Andrés sparkles like a Christmas tree; that Messi goes mad at the entire Madrid backline; or that Víctor Valdés flubs a pass in the first minute and gifts the Evil Empire a goal to the roar of the home crowd … and then continues to play the ball out the back the rest of the match? Like Pep says, if Valdés becomes “wiser”, or more “prudent”, or even more “strategic”, then Puyi can wave his arms around like Don Quixote’s windmill all he wants … the flags are flailing. But Valdés is a leader, too — he’s the Keeper of the Clean Sheet, he’s the offensive line’s first touch, he’s the team’s third captain. And so he takes and touches, passes and putts. For that reason, Víctor Valdés is my MOTM. Agreed, Kxevin. It’d be a shame to drop more points against smaller teams as I can’t see them dropping many. It is interesting that over at Bassam’s place there is a hope that it is over before the next Clasico. Not much belief there now. However, to be strictly accurate it is probably equally in our hands is it not? If we don’t drop any more points and beat them at Camp Nou we win on head to head? That is correct, Jim. But think about this: They’re resting, and waiting for their next opponent. We flew to Japan, where we will have to play at least one match against a highly-motivated opponent(s). Recall how difficult the last World Clubs was. Success brings more opportunities for fatigue. In theory, if we win out, we are champs, as I note above. I just don’t see that happening and frankly, they seem to take their “lesser” opponents more seriously than we do. I don’t see either side dropping many more points, as both clubs know what’s at stake. But our mental lapses can’t be cured as easily by the kind of direct, attacking football they play, even as we are a more direct team this season, thanks to Sanchez and Fabregas. Rafinha: I think we should be grateful for the opportunities that the coach give us. There are many clubs with really good canteras, but of course we have a great coach who gives us this kind of opportunities, it’s a real joy for us. It’s not about being better or worse than other [canteras], the difference lies in the fact that we get to play with the first team. And of course it’s up to us to make the most of it. C. Interviewer: What about you, Thiago? Thiago: I think they’re doing a really good job at the cantera. The first team is like a mirror for all the kids of the cantera teams. We have a coach that dares to bet on kids who are 18 or 20 in my case, 18 in Rafinha’s case, who believes they will be able to play at such a high level… and if we do end up playing at that level it’s thanks to the trust and confidence he instills in us. 1. The third goal was a counter-attack, we scored against the best counter-attacking side in the world! 2. Every classico we hear that Mourinho has created the team to beat Barca, but he ends up losing by goals scored by new boys in Barca. Maybe Guardiola is the one who brings in players to beat especially EE? 3. The history of current classicos has had this burden on EE that they simply can’t gain full confidence against us. You can see from their body language and movement. Against any other team, Thong boy and Benzema would have scored those shots. 4. Barcelona will lose a game only if Barcelona wants to lose (aka Getafe), there is no way around it. Puyol the spiritual MOTM for me. His leadership was key for younger guys and he became a rock as the game went on. I love you all! Visca Barca!!! What a rollercoaster ride of emotions this Clásico was. Sanchez and Cesc are both super signings and only 22 respectively 24. I sometimes tend to forget that Cesc is still young, because it seems an eternity since he captained Arsenal! Oh, and Puyol is the best defender, captain and motivator that has ever walked on this earth. He got CR in his pocket. You’re just so darned cute. I just want to cuddle you, and give you all the love in the world. It is fair to say that Barca’s second goal came from luck but Real Madrid’s only goal came from luck also. In reality, Barca are, and have been for quite some time, light years ahead of Real Madrid in nearly all aspects of football. Our philosophy on the pitch is more defined and has been for 20years. Real Madrid don’t have this philosophy, which shows it by the fact that Real Madrid produce good footballers which never make it through to their first team, instead Soldado, Negredo, Mata and Valero all have to look elsewhere for first team opportunities and all of which are of sufficient quality to play for them. When a player from Castilla gets promoted, firstly they don’t get enough minutes and secondly the first team always plays a different style (possession, counter attack, defend deep, push forward) and formation depending on the current coach than their youth teams do. The other thing that is a massive problem is the amount of politics in the club. Due to the fact that the president is always walking a tightrope, they never give a manager or system enough time to develop so they can never give their players enough time to learn. This constant hunger for immediate results means that they have lost all continuity. This may have been solved with Mourinho but do you think Florentino will be as accepting if once again Mourinho fails to deliver the La Liga and Champions League? It must be noted, Madrid are the most successful team in the CL history but 5 of them were won over 40years ago. Since Madrid last won the CL in 2002 they have only won 3 leagues while Barca have won 5 leagues and 3 Champions Leagues. I don’t think your argument that once Barca come across CL teams our defense will be exposed because we were a disallowed goal away from 3 CL finals in a row and are the current CL holders. Meanwhile Madrid before last season had failed to get past the round of 16 since 2004. This isn’t because we, as fans, are better than you Madridistas, but OUR club IS better than Real Madrid currently and until you guys get the stabilization similar to what Johan Cruyff brought to us we will continue to be. Funny, the comment I was replying to seems to have been removed. It never hurts to have some facts up here; maybe it’ll discourage other trolls from sullying up the place. And so what? That Real Madrid squad that won 5 champions league titles in a row was phenomenal. Beautiful football that was too entertaining not to fall in love with. The fact that it happened 40 years ago doesn’t make it any less significant. It’s like saying 50 years from now the 3 CL trophies that Barca have won are less meaningful. And if you are actually looking for the last 20 years of absolute stability, then Real Madrid have also won 3 CL titles. Here you make the mistake of thinking that every club philosophy is to produce players from within, which isn’t correct. Don’t get me wrong, what Barca is doing with youth players is admirable and RM have to go back to their roots, but it isn’t the only way for success. Out of all the players you named above, i would probably have Mata back. Even then he won’t be a starter. (I’ll continue on this point below). Why do we need a Johan Cruyff? We had our Johan Cruyff a while while back, and his name is Santiago Bernabeau. Him and Alfredo Di Stefano created a philosophy for the club that is well defined: Direct attacking football in a team that has the best in Spain, best in the world and the best of the Cantera (1/3 each). Has the team deviated from that the last 5 years? To some extent, yes. But that is normal, as any club goes through rough periods. The total football being played right now in Barcelona was not apparent in that 6 year drought. It took the purchases of Ronaldinho, Eto, Guily, Deco and others to bring the team back on it’s feet. In the end, we didn’t lose the game because of lack of philosophy. We lost the game due to lack of hunger and because the opposition we are against is the best in the world right now, and they wanted it more than us. Anyways, congrats on the win. Well deserved. Let us see how the next 20+ games go. A lot left to play for from both teams. My Atleti lost today, too. It’s ok. I was due for a long hard cry. Thanks, Miguel. Atleti completely lost the plot today, no? Blessing in disguise if you ask me. Manzano was never the man for the job. Heh! No, Manzano’s awesome. He’s assembled a great squad. I blame that cockroach Perea. How is he still on the team? Hey Bassam! I don’t usually read RM sites, but I checked out your post on your blog, and I found it a good read. Well-balanced, no self-flagellation, no finger-pointing, just a thoughtful and intelligent assessment of where both teams are at. Well done. Thank you, Blitzen. I thought we were very good until the 2nd goal. We knew we were up against a better side, and that deflection was a really slap in the face. Then came the third goal after we missed an absolute sitter of a chance and the game was over. As someone pointed out above, Ronaldo missed two chances that he would usually score with his eyes closed. Even in our counters, we would have a lot of space yet become waaay too clustered to execute. The fact that we haven’t beat Barcelona in a while is weighing in psychologically. Barcelona being mentally strong and superb doesn’t help at all. Still, as i mentioned, many more games to be played. The season is still young. Relax, Bassam. Ciaran was, I think, responding to a rather rude troll whose comment has since been deleted. Didn’t mean to sound aggressive in my comment. And in case I did, then my apologies. Was just correcting some misconceptions that are very common among Barcelona supporters. Nah, not too aggressive. And you have every right to defend your team. Just thought you should know that there had been a very umBassamlike comment above to which Ciaran had responded. Look forward to being on the same side as you come this summer. Go Spain! yes, like mom4 said, there was a rude troll whose comment was deleted. just like you defended your team, Ciaran was also defended our team. The above comment is hilarious. I see some people have their minds after getting their @$$es handed to the year after year. Do come back when you actually win against us. As for now, WE ARE THE BEST! That was swift mods. Well done! No one dare mess with Kari! The high standards Bassam has set shall not be tarnished by a troll!! For that guy who’s comment has been deleted when he comes trolling back. I wanted to comment on the idea that luck exists. It does not! But the saddest thing of all is that Cosa Mostra and Mourinho use the illusion of luck when it suits them. Take for example Benzema’s goal. Was his goal lucky NO it was a combination of: skill, being in the right place at the right time and an insane amount of defensive screw ups. Same thing is true with Xavi’s goal it was skill (his ability to shoot the ball accurately toward goal on a volley) being in the right place of the right time and a defensive screw up by Marcelo (not hitting the all well enough to clear it) . In conclusion there is no such thing as luck (no room for it in physics) just the illusion of coincidences. Sorry, in a good mood today for some reason . . .
Otra alineación diferente después de 26 partidos oficiales. Guardiola sigue sin repetir once esta temporada. El equipo titular del Clásico era inédito. Another new lineup: after 26 official games this season, Pep keeps on without repeating a starting 11. the starting team for yesterdays Clasico hadnt been seen before. oops shoulda read the whole thread b4 i posted that. – Piqué y Puyol han jugado juntos 55 partidos de Liga y el balance es de 46 victorias y nueve empates. – Puyol, además, este sábado recuperó 14 balones y no perdió ninguno. Sólo cometió una falta y recibió una. Pique and Puyol have played 55 games together in the league and the balance is 46 victories and 9 draws. in addition puyol on saturday recovered 14 balls and lost none. he only committed only one foul and he received one. that was efficient, that was cool, that was collected. there was a lot of hullabaloo before the game, but, damn FCB shut those guys the hell up with a performance of champions. don’t really like you, but I respect the hell out of you. Well done. Hey, Cules! Just in time for me to swear off acquiring any Barca clothing, that craptastic fcbarcelonashopusa is gone. Dead. Normal business has resumed from the main store at fcbarcelona.cat. So yes, I already have my copy of the new book ordered, one of the few things you can get that isn’t festooned with Qatar Foundation. I also that the Nike MES Foundation appears to be no more. For the unfamiliar, it was a foundation/fund that helped to support sport and education in challenged nations. A percentage of all goods sold went to the foundation, and the club also supported it financially. The best was his reaction at 1-1. I swear there is fear in his eyes. he knew things are going to become really bad. Kxevin, you follow the NBA don’t you? Can you explain to me why the Lakers is pulling out from the race to sign CP3, Cris Paul? That’s their target so if it failed twice, why don’t they try to work something out especially now that Odom is already out.